Jaz Parks returns in this, the third book of in her eponymous series. She is a tough-as-nails assassin, working with her team of creative geniuses of various natural and supernatural talents to take out the bad guys of the world. We have yet to meet the big bad, against whom they've been working since the first book, but in the meantime his henchmen have proven to be deadly enough on their own. Jaz and her team, led by master vampire Vayl, are sent to Iran to assassinate a terrorist the U.S. government has been after for years. She finds herself joining forces with her twin brother's team, which creates a number of interesting issues. First of all, there is some tension between Jaz and her brother, stemming from events that occurred prior to the first book in the series, which adds to the issues Jaz has to deal with during the mission. Second, it is clear that someone on her brother's team is a mole, and they need to figure out who it is before it is time to carry out their mission. Their are further issues to complicate matters, but you'll have much more fun if you discover them for yourself. In this book Jaz goes to some dark and scary places, and she retains her stubborn toughness while remaining appealingly vulnerable in certain ways. There are many elements in this series that will be familiar to readers of the genre, but the suspense, humor and skillful characterization never fail to grab my attention. I particularly enjoy her treatment of secondary characters, who are fully fleshed and have their own issues and concerns. When I approach a new book in this series, I look forward to visiting with old friends, spending time with people who make me laugh and sit on the edge of my chair, caught up in suspense. There are hints of further difficulties ahead for Jaz and her hodgepodge of a team, particularly as each book takes them a step closer to unmasking their behind-the-scenes adversary - and I look forward to following along with them every step of the way. Here is an interview with Jennifer Rardin at Love Vampires. Graeme's Fantasy Book Review: "...despite the shortcomings I found myself really enjoying the story itself. 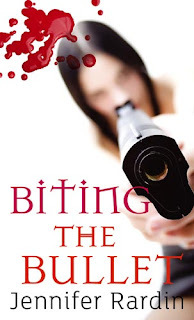 ‘Biting the Bullet’ doesn’t take itself too seriously and this is evident in the relentless onslaught of car chases, gun fights and acerbic conversations with the undead." Love Vampires: "Jaz Parks is the character that you would get if James Bond was female, American and battled supernatural bad guys rather than just your average human megalomaniacs." The Movieholic and Bibliophile's Blog: "It’s an action-packed story...with really great characters, funny dialogue on every page...scary blood and soul-sucking bad guys, save the world type of plots, etc." Joanne - If you enjoyed the first one, you're going to love the rest! This was the last one I read. I need to sit down and re-read the series before I pick up the next few.